What day of the week was I born? What day of the week is April 8 2024? You've got the message that your beloved auntie comes to your place on 5th April. But what's the day of the week of that visit, is that a middle of the workweek or is it a Sunday? 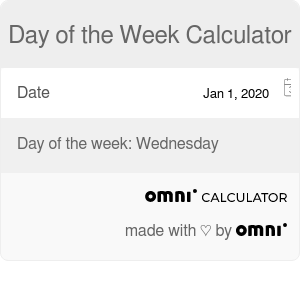 Our day of the week calculator is prepared for such questions - just select the date from a calendar and the tool will display the day of the week. Check out what day of the week you were born on, or what day of the week is April 8 2024, which is the day of a total solar eclipse for several states. If you're interested in the origins of the days of the week, you won't be disappointed as we also wrote a short paragraph about names. People often want to know which weekday they were born on. How to find what day it was with this day of the week calculator? Click on the displayed today's date. The calendar appears. Choose the year of your birth from a drop-down list. Using the arrows, select the month of your birthday. Finally, click on the day of your birthday. With this day of the week calculator, you can quickly check many other dates, for example you can find out that next total solar eclipse in the US is on Monday. Have you ever wondered what is the etymology of the weekday names? No? We neither. Apart from obvious Sunday, we didn't think about it before. If you're satisfied with this day of the week calculator, maybe our other tools will be useful? Do you need to know what the date is in e.g. 60 days? This day counter is a must. Can't wait for Christmas time? Check out days until Christmas tool. If you're pregnant and want to calculate not the weekdays, but in which week you are, have a look at due date calculator. Day of the Week Calculator can be embedded on your website to enrich the content you wrote and make it easier for your visitors to understand your message.